My name is Annette Tersigni. (Ter-See-Knee), Founder of the YogaNurse® Model of Care. 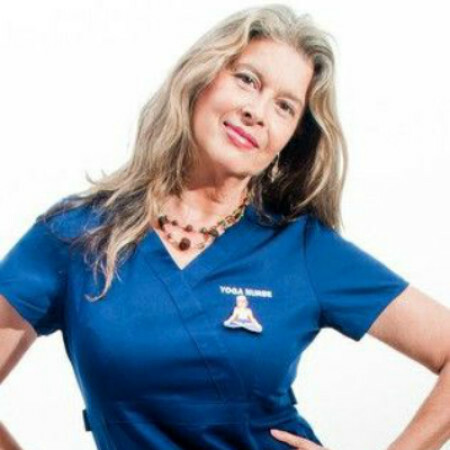 AS an RN and yoga therapist, I teach a safe Rx to nurses, yoga teachers, and everyday people, serving experiential, feel good remedies. I treat stress, anxiety, pain & suffering– in your body, mind, spirit and bank account. To create a global army of modern nightingales, Yoga Nurses, to uplift and expand consciousness in health care; relieve stress, anxiety pain and suffering, and create health, peace and wisdom for nurses and their patients worldwide. -Yoga is my power tool. Testimonials from Nurses who have taken our trainings. The Certified Yoga Nurse training has been such a wonderful part of my life. I am so thankful for Annette and all of her great wisdom. Becoming a certified Yoga Nurse has offered me countless ways to unite two of my passions , Yoga & Nursing. Annette is heartfelt, smart and a wonderful mentor. she has years of experience to make each one of us find the best within ourselves. I am privileged to be a part of the Yoga Nurse Army. I enjoyed the webinar of the training with the other CYN and the Special attention Annette gave each one of us. The love and guidance from Annette has been a blessing to live my true life’s purpose.